We love reading quality stuff, be it a book, magazine or something similar. The regular readers of ThinkerViews know that Reader’s Digest (India edition) and Safari (a knowledge magazine) are the ones we love to read and share our unbiased views and reviews about. 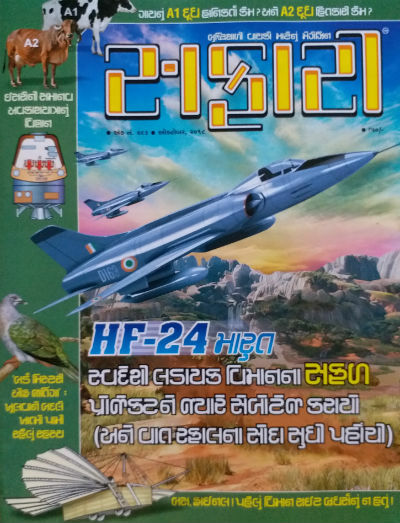 So, like every month, we were curious to get our hands on the October 2018 issue of Safari (Gujarati Edition). The good thing about unbiased knowledge magazine is, it gives you an objective analysis in broad aspects and context in quite a realistic manner about some important current happenings. We strongly believe that while we all know that we shouldn’t judge a book (or for that matter any media including a magazine) by its cover page, but, we cannot deny a cover page’s influence on a purchase decision. It is something similar to liking an attractive and neat and tidy person amongst a group of people. As you can see, the cover page of October 2018 issue of Safari is quite decent, informative, and attractive. The illustration of HF-24 Maruts flying high in the sky in the backdrop of borders and colorful sky is nothing less than mesmerizing. We also see a small illustration of “winged” airplane, which was the first airplane (and yes, it was not by the famous Wright brothers!). There are few more articles mentioned on the cover page, but let us discuss them later in this article. The greenish background makes the cover page “cool”. So, overall, an attractive cover page. Some people are so brainwashed with the paid media campaigns that they consider everything from the west as the best. And, some of them feeling ashamed to recognize some of the incredible things/events/stuff from the motherland. Unless and until we are proud of our own stuff, how can we expect others to recognize it? Of course, it does never mean that we should blindly do narcissism about everything we have. But, we must have to be objective judging the things. The “Incredible India” segment of Safari brings in some interesting facts from various parts of India (that is Bharat) and talks objectively about the facts associated with the same. This issue brings in factual information about the famous Iron Pillar (लौह स्तंभ) of Delhi. Here is a public domain video from Rajya Sabha TV about Iron Pillar, Delhi. Iron Pillar is considered as a mysterious one. However, the makers actually worked on making a composite metal in a way that can prevent itself from rusting. And, for that, they have studied the environment of the place deeply. Until we understand the science and facts about something, it looks mysterious or magical, however, in reality, everything remains the way it is due to some reasons. These days the article(s) related to the famous “Rafale Deal” are trending in all types of media. some are trying to use it politically to expose a scam in the deal and others are defending it. But, no one is talking deliberately about the situation which made India be dependent on the foreign countries for weapons and other military needs! It is actually a series of events, plans, corruption, sabotages and much more, behind all these. Just think that if a country which can produce the rockets and satellite launching vehicles which are the most reliable and economic in the entire world, can’t it produce airplanes which can be of fantastic qualities? Of course, it can. And since the time of Pt. Jawaharlal Nehru, the first prime minister of India, who envisioned India to be self-dependent in the security aspects, the projects are going on. And the scientists really made some remarkable breakthroughs, but, the things never kicked off the way they should. And, one can understand the reasons behind it. A detailed article about India’s ventures of building “self-made” airplane for warfare and how the things went wrong (deliberately due to some influences, in many cases); is definitely not to be missed. The articles bring in information about the importance of Jet engines also. And yes, as always, the articles in Safari are known to bring in some lesser-known but important historical incidents as well. When you read the history of HAL and the way it has its roots situated in a small town of Gujarat, India; it will make you proud for the nation. This article also makes me refer the editorial for this issue. I mentioned it often in the past as well that I consider “the editorial” as one of the most important segments of the magazine issue. It lets the editor share his/her views about the current happenings, and more importantly his/her vision for the content of the issue as well. So, it works nothing less than a bridge between the reader and the editor. The editorial of this month talks about something significant which is less talked about by the sensation-hungry media. It is about Shri N. Nambi Naryanan, a remarkable scientist from ISRO. Here are a couple of videos from the news channels and media houses who cover this news in their own way. Do you think the compensation of Rs. 50 lakh will give him his reputation, and more importantly the time, back? Don’t you think actually the country’s loss is much bigger than his personal loss? An editorial, not to be missed. There is an interesting article by Sushil Bhatiya in this issue where he talks about various categories of Cow Milk. Frankly speaking, I didn’t know much about A1 and A2 types of milk before reading this article. The article talks in detail about the types of Cow Milk. And, more importantly, the author explores the historical incidents of past which lead to the hybrid cows and various types of milk. And, there is no prize on guessing it correct, the reasons were more economical than the necessities! And, it is interesting to know that A2 milk is better in quality than A1 milk! While other countries are importing the sources of A2 milk, we are still not much aware of it and running after A1 milk (sometimes unknowingly). It is rightly said that “the knowledge is the power”. Whenever some talks about airplanes and its history, it is obvious to remember The Wright brothers, Orville and Wilbur. They bagged the credit for making the first functional airplane in the modern history of mankind (with proof). However, if you are familiar with many other claims and controversies, you might have heard about Gustave Whiteheads. Gustav is considered as the first one who made a functional model of an airplane which he flew. Embedded above are two videos from the public domain of YouTube, and if you try to search on the topic, you will find many more. The issue came to limelight when a reputed magazine brought out the details about Gustave. Rather than telling more about Gustave and his case, I would suggest you read a very detailed article about it in this issue. In addition, you will find a detailed article about ISRO’s mission to send humans to space. The interesting segment is the answer of, why such missions are necessary or what significant benefit it brings to the country. The article about Jatinga, a place in the hilly area of north-east India, which attracts some birds to commit suicide (which ultimately becomes a source of a feast for the locales) is definitely worth reading. It makes you think that we, human beings, are probably the most dangerous species. D. N. Kaushik seems has done remarkable research for this article. There are regular sections like “FactFinder and Q/A” among others, which makes the magazine definitely worth reading. Recently, when a fellow from Gujarat, won a remarkable amount in a TV show named “Kaun Banega Karorepati”, he credited Safari for being a great source of knowledge for him. We wish that it can be the case for you, and may the knowledge you achieve from such genuine sources bring some fortune for you as well :). Definitely, worth your money and especially the time you spend to read it. Don’t give it a miss. The only thing I can mention as a drawback of this issue is, it is available in a regional language (Gujarati) and thus its reach is limited. Do let us know your views about this article via comments below, we like to read you. And yes, do not forget to share this article with your friends who you think are interested in quality reading. Also subscribe to our newsletter, to get notified periodically about the articles we publish.